There are approximately 15 different species of chipmunk found throughout the United States, according to the Internet Center for Wildlife Damage Management. 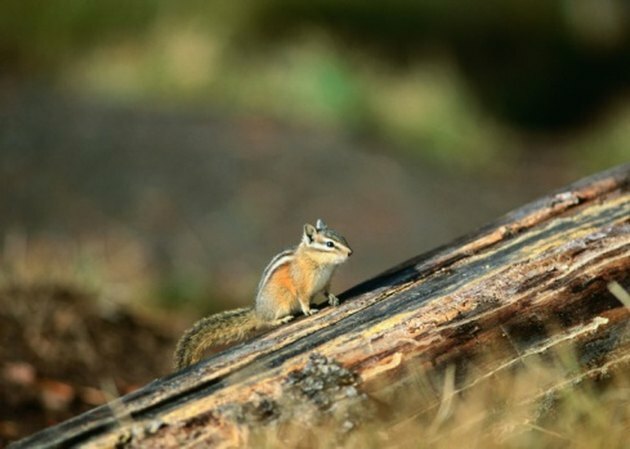 For many, chipmunks are minor pests, although this is not true for all homeowners. Chipmunks will enter a garden or yard and eat vegetation and flowers, and they spread illness, including rabies. Keeping a chipmunk away from your home and family involves using both physical and chemical control methods. Contact your local Department of Natural Resources to learn if shooting chipmunks is legal in your state. Place mothballs around the perimeter of your home or any other areas that you want to prevent chipmunks from entering, including gardens or flowerbeds. The chipmunks will be repelled by the odor of naphthalene, which is a main ingredient in mothballs. Cover flowerbeds or vegetable gardens with bird netting or mesh hardware cloth. These items will prevent access to the area, as the chipmunk will not chew through the metal. Cover vegetation or flowers that are intended for human consumption with ammonium soaps. The chipmunks will find the taste of the soaps offensive, and they will not consume the vegetation. Set baited rat traps or sticky traps around the perimeter of the home or any other areas that you want to repel chipmunks. These traps will catch the chipmunks that are then either killed or relocated. Use small nuts or a dollop of peanut butter to bait snap traps. Allow a household pet to hang out in the backyard. The family's dog or cat will scare away chipmunks, thereby controlling the population in your backyard. Remove any possible sources of food from the property. Pick up bird seed on the ground and avoid feeding pets outside. Store bird and pet food in plastic totes to prevent chipmunks from gaining access. Prepare a solution of 2 tbsp. garlic powder and 1/4 gallon water in a plastic spray bottle. Shake the bottle and spray onto flower beds, around the perimeter of the home and onto outdoor wood piles. Chipmunks find the smell of garlic offensive, and they will stay away. Reapply the garlic solution after any heavy rains.